watlow - Brian Enos's Forums... Maku mozo! Has anyone looked into the double alpha magnetic mag holders? I have a friend having firing pin issues. Does anyone offer a titanium one or has any one had issues and found a fix for a similar issue? Definitely a lot of lead punched out of it. Only 1 of the outer ports would allow a pick through it. Personal opinion but work with your M&P work hard on fundamentals discipline and stage planing. I'm a C shooter aiming for B in production this year. 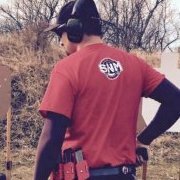 I have a friend invested in a high end limited gun before learning technique and he is struggling. My opinion spend money on ammo over technology and you will be a much better shooter in other divisions down the road for staying with the basics in production M&P's have been rock solid for me. I think my break caught a bullet at some point this weekend at a steel match. It took a lot of force and time to get out what I could. Weight of debris removed feels about 2/3 of a bullet. No performance issues noticed until a deep clean after the match. I also have had timer issues at every match so it's time to move on to a new break any help or references to a better or worse 9mm break. Looks like a nice setup....any trigger work worth doing? I recently came across a "prodution" smith M&P 9L for sale when I got clear pictures of the gun the front of the slide appears to be machined or modified to a rounded edge. I found in some research this was something people did to balance the gun. I do not believe it to be production leagal. Any help would be appreciated. ^^^I saw this the other day^^^ why are we parting ways with the gun?